Product prices and availability are accurate as of 2019-04-16 05:18:34 EDT and are subject to change. Any price and availability information displayed on http://www.amazon.com/ at the time of purchase will apply to the purchase of this product. 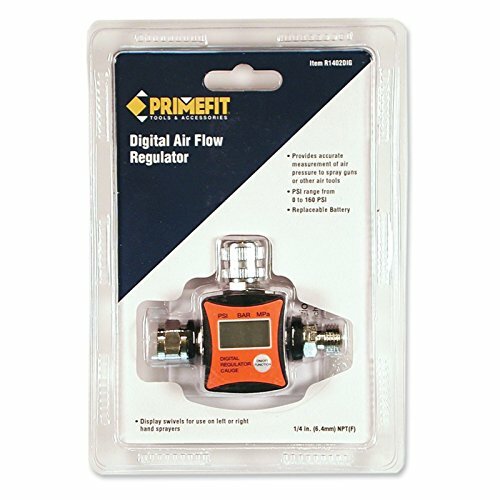 Achieve a high-quality finish when you mount the Primefit Digital Air Flow Regulator directly onto your spray gun. 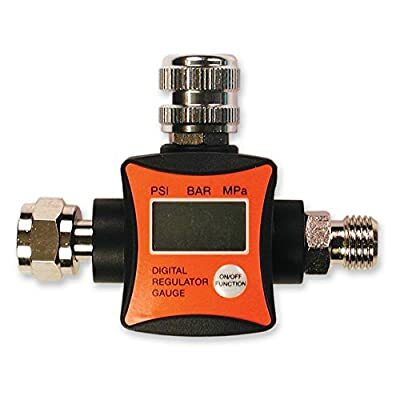 This regulator allows you to regulate and maintain precise air flow pressure from +5PSI to +160PSI and features a large digital display reading in PSI, BAR, or Mpa. Durably constructed with a four-year battery life, a replacement battery is also included. Dimensions: 5.25L x 1.5W x 7.5H in.. Adjustable airflow from 5 to 160 PSI. Digital display. Directly mounts to spray gun. 4-year battery life. Manufacturer's limited 1-year warranty.